Spring is officially upon us, and with it comes the annual flurry of activity known as spring cleaning. Even if you got started early and have already cleaned your house from top to bottom, the job won’t be done until you’ve considered your home from another vantage: the outside. Spring cleaning outdoors involves repairing your landscape from the ravages of winter and prepping your yard for a good growing season. It’s about clearing away things that are dead or no longer serve you to make room for new growth. The quickest and most effective way to spring clean your yard is to contact a good local landscaper. If you want to undertake the work yourself, you may want to consult our checklist of landscape tips to get your yard ready for spring. Cleanup is an important part of lawn care. If you want healthy, attractive turf, you need to address any debris or overgrowth that can keep your grass from thriving. Pick up any branches and twigs that have fallen during the winter, and discard any trash that’s blown into your yard. If you find any waste left behind by pets, clean it up. Rake up fallen leaves so they don’t suffocate your lawn. You should remove the thatch from your lawn every 2 to 3 years. You can tell your turf is ripe for dethatching if it feels spongy to walk on it. Thatch is a layer of old grass cuttings interwoven with your living lawn, creating a carpet close to the roots. In small amounts it can be helpful, acting like mulch to keep the soil cool and moist. When you have too much thatch, though—say, more than a half-inch—it can smother your lawn by preventing grass roots from absorbing air, nutrients, and water. You can dethatch your lawn at the same time you rake leaves, by pushing the tines of the rake deeply into the grass. Or for quicker results, you can use a dethatching rake or a rented power rake. 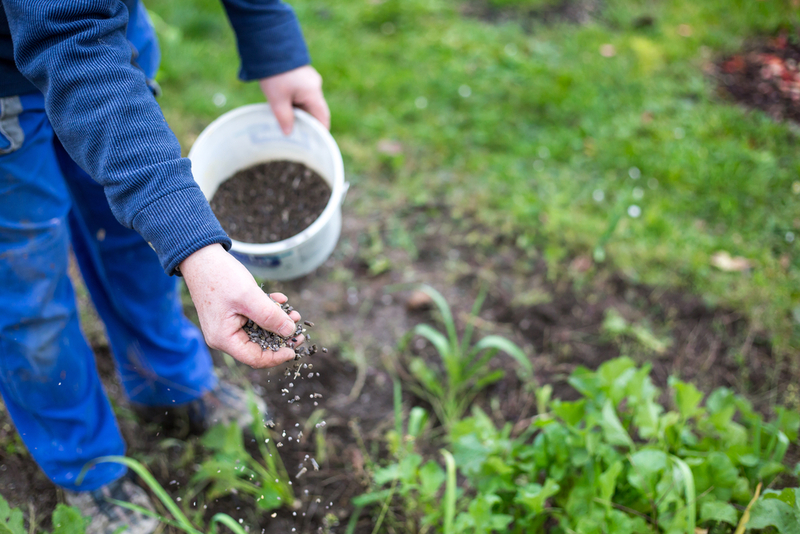 If your soil has become too compacted, it can also keep your lawn from properly absorbing air, water, and nutrients. If you have bare patches in your grass, the soil is probably compacted. You can tell when your soil is compacted because you have trouble sticking a pencil into the surface of your turf. Mowing more frequently but cutting less makes for a more luxuriant lawn. Set your mower to the maximum height for the type of grass you have, because taller grass helps keep the soil cool and moist. Re-edge the borders between your grass and your flower and vegetable beds. It helps define the division between landscape and lawn and gives your yard a crisp, professional look. Do you tend to have problems with crabgrass? Consider applying a pre-emergent fertilizer to your lawn, which will feed your lawn while preventing crabgrass from germinating. Just make sure you don’t use a pre-emergent when you’re overseeding your lawn, as it will also prevent your grass seed from germinating. If you have bare or thinning patches in your lawn, you can help it thrive again by laying new sod or overseeding. To ensure your new grass thrives, water daily for the first two weeks. Don’t mow your new grass until it’s at least 2 inches in height. Clear your vegetable- and flowerbeds of debris like weeds, fallen leaves, and rotted mulch so they don’t smother your plants. Pull out any dead annual plants from your garden bed. Once you see new growth on your perennials, prune them down to the ground. You can also use this time to divide any overgrown perennials, giving the plants room to thrive while filling in your landscape. Sprinkle fertilizer around the base of your plants as opposed to shoveling it on top of them. Mulch is truly your friend in St. George’s desert climate because it keeps the soil in your plant beds cool and moist during our punishing summers. Mulch also provides nutrients to the soil, keeps weeds at bay and can be quite decorative. Inspect your yard to see if any of trees, plants or shrubs were damaged over the winter. Remove dead plants and prune any dead, broken or diseased branches. You can also cut back growth encroaching on walkways and outdoor gathering places. Thinning branches can be very beneficial because it lets more air and sun into the center of trees and shrubs. Prune your roses before the leaf buds open, removing any dead, dying or diseased wood. Look for canes that appear dry, black or shriveled and make clean cuts at a 45-degree angle. Have your landscaper come out and inspect your sprinkler system. They can make sure it’s clean and in good working order and adjust the sprinklers for season-appropriate irrigation. If you don’t have a sprinkler system, consider having one put in. You can also ask your landscaper if they can clean out your gutters. If you plan to have a beautiful yard for spring, you should be able to enjoy the view. Cut overgrown bushes, shrubs, trees or vines away from your windows. Give the glass a good cleaning both inside and outside, and welcome some spring sunshine into your home. Once you’ve made your yard a place where your plants can thrive throughout the spring, take some measures to make it pleasant for you. Wash your patio furniture using water and dish detergent and hose down paths, patios, and stairs. Spring is also a great time to think about future improvements to your landscape. You may want to beautify your yard with a water feature or have more lighting installed. You might consider introducing more cool spots by planting shade trees or building shade structures. Or you may want to fully embrace outdoor living by putting in outdoor seating, a firepit or a barbecue. Your landscaper can be your greatest ally in making sure your yard looks its best. Do you want to make your landscape shipshape for spring? Add color for curbside appeal? Or redesign your yard entirely? At Stonetree, we’re ready to roll up our sleeves and make it happen. Contact us for an estimate.